Friendly staff at ski-rental. Sufficient breakfast. Spacey apartment. Second time at this hotel, overall a nice stay, close from the gondola and city center. 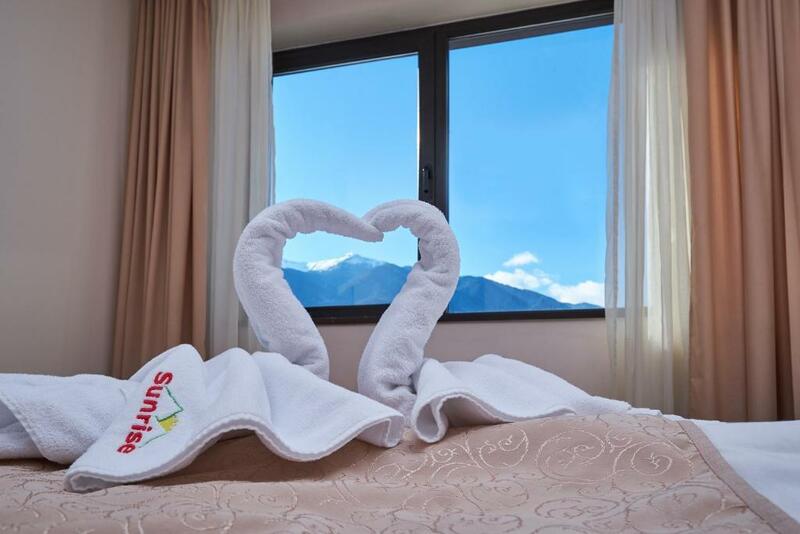 Very warm rooms and very beautiful view, 7 to 10min walk distance to gondola (ski lift ) but in hotel there was free shuttle bus with standard scheduled root gondola to hotel . I stayed with my mum and my daughter and we were extremely satisfied! Our studio was very comfy, the beds were comfortable and it was really warm. We enjoyed the spa facilities and relaxed with aroma massage. The staff was always helpful, either at the reception or at the lobby bar. The breakfast was delicious and there was so much to choose from.Really lovely place to stay and we will definitely come again!!! Great place, clean with good service and great food. I like the location of the hotel, and the kitchen was great. The meal was perfect. Food in restaurant was very good. And met the standard you would expect. The pancakes at breakfast were great. The apartment was big. Sunrise Park Complex This rating is a reflection of how the property compares to the industry standard when it comes to price, facilities and services available. It's based on a self-evaluation by the property. Use this rating to help choose your stay! 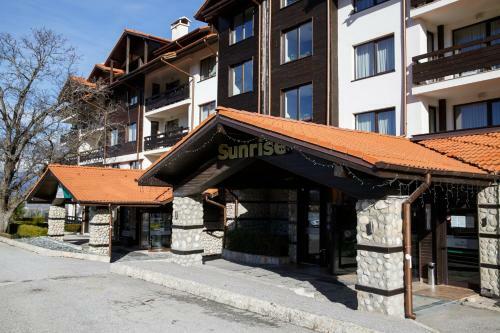 One of our top picks in Bansko.Sunrise Park Complex is only a few minutes' walk from the first ski elevator station in Bansko. 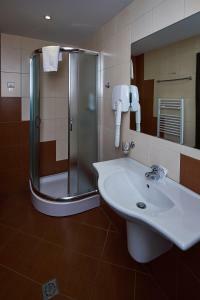 It offers accommodations with natural materials and free Wi-Fi in public areas. 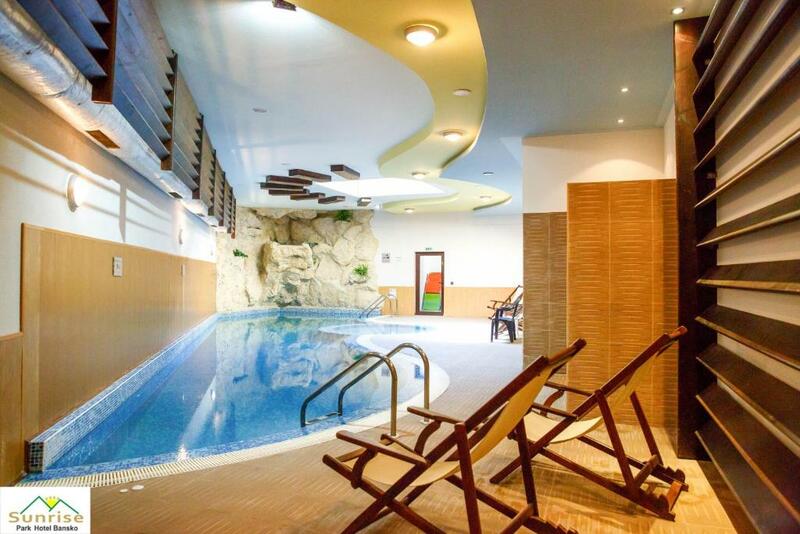 There is a ski wardrobe, a restaurant, a 24-hour lobby bar, a well-equipped spa center with an indoor pool, a sauna and a steam bath, as well as exclusive body and beauty treatments. Sunrise Park Complex is surrounded by a large garden with a barbecue area. An underground car park is provided. 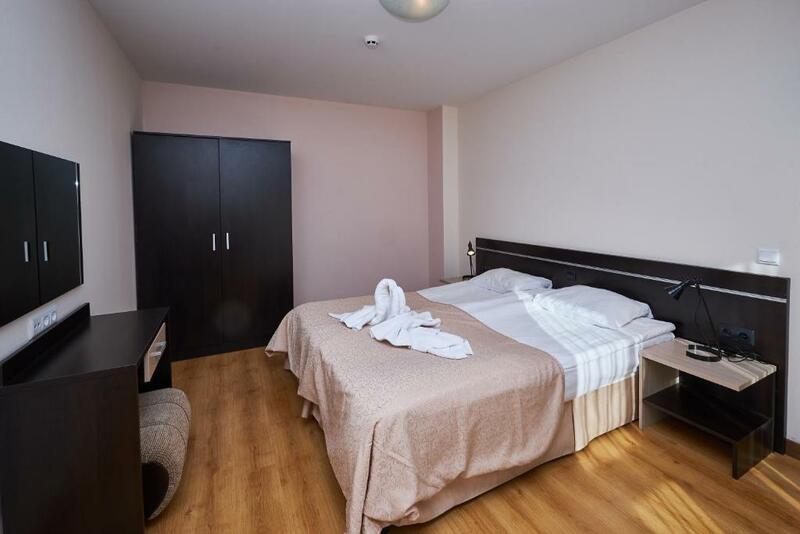 Within a radius of a 5-minute walk, you can reach the historic part of Bansko and various bars, restaurants and shops. Shuttle bus to the gondola elevator is included. 뀐 Located in the top-rated area in Bansko, this property has an excellent location score of 8.1! 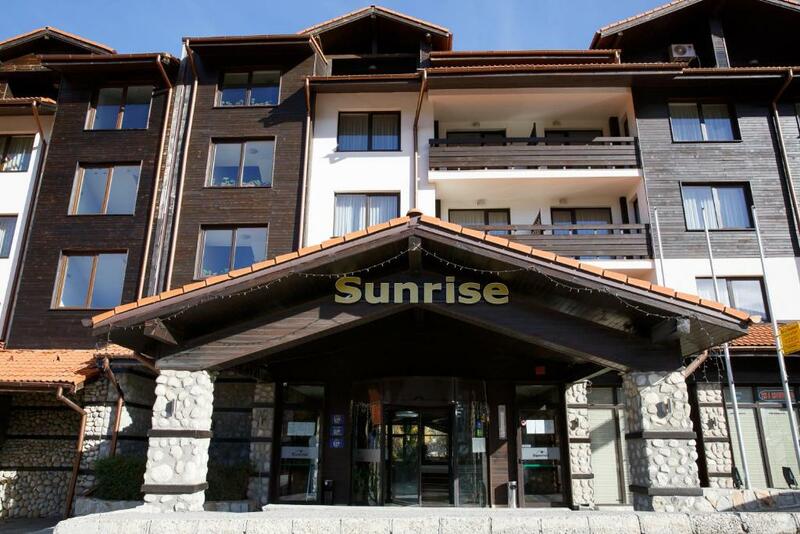 When would you like to stay at Sunrise Park Complex? Mountain view, living room with sofa bed. Please note that cooking is not possible. Mountain view, two bedrooms, a living room with sofa bed. Please note that some apartments are split-level. This apartment has a balcony, private entrance and electric kettle. This apartment features a balcony, seating area and kitchenette. This apartment has a balcony, mini-bar and sofa. House Rules Sunrise Park Complex takes special requests – add in the next step! Sunrise Park Complex accepts these cards and reserves the right to temporarily hold an amount prior to arrival. Please note that reservations made without a credit card require a prepayment deposit via bank transfer. The property will contact you with payment instructions. Staff from other countries (Ukraine), confusing Magerita with 4 Cheese. Other people in the hotel walking in ski boots inside, even if stated it is forbidden (hotel staff shouldn't follow the rules?). Dinner menu and quality : 2 stars. Very (VERY) poor Wi-Fi quality in the rooms (5 mins for 1 internet page?). 20 TV channels (10 with music, 5 Bulgarian 3 with news and F TV). It was a bit old and it had few non esthetic facilities. The spa section it’s definitely overrated. You have to pay for jacuzzi. The Internet connection was very very bad so we couldn't connect to any WIFI network with enough signal. The "SPA" is just a hot swimming pool and a sauna, nothing else. The road to go to the hotel is always full of buses so you have to wait 10min every time you want reach the hotel or go by foot. The breakfast is good with many options. we liked the bed and big rooms. It is cozy. The cleanliness at the spa area can be improved. Also the breakfast can include juices much more qualitative. WiFi signal in the rooms and saloon it was very low, for 4 nights they didn't changed the beds linens only some towels and the second day they didn't clean the bathrooms . Wi-Fi. It was very very bad. In the room there was no internet at all. On the balcony was very weak signal. One of us needed to spend some time for working so this was very big problem. All was good except Wi-Fi. What I didn`t like was that the shower and the sink drain was draining slow, and also the water in the pool was not that clean. Room was not very clean. Dirty ear buds on sink on arrival. No toilet paper and no shower curtain on the shower. 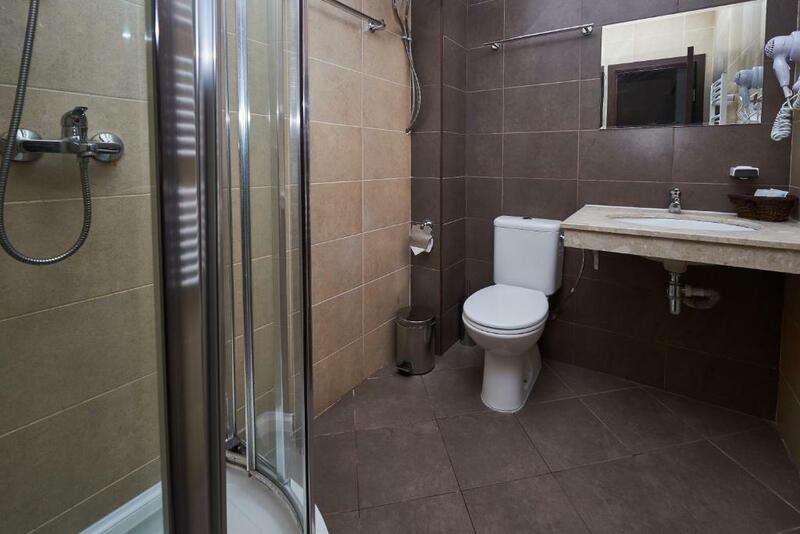 Bathroom was often soaking wet as a result. Mini bar was also never re-stocked. For a trip with friends it served its purpose but I wouldn’t visit with family or loved ones for sure.